On April 13, 2012, Palm Harbor University High School will be the location for the 2012 Relay For Life event. Not only is the local high school getting involved, but Firefighter’s from Palm Harbor Fire Rescue have formed their own team and will help fight the cancer battle as team “Rescue Heroes” in keeping with this year’s cartoon theme. The firefighters have been actively participating in Relay For Life events since 2006. “Our inspiration comes from those who have fought against cancer, are currently fighting cancer, and whose families and friends that have supported them. It is important for us to show our support to our own that have battled cancer and to support our community in this fight,”commented James Angle, Fire Chief of Palm Harbor Fire Rescue and Team Captain. 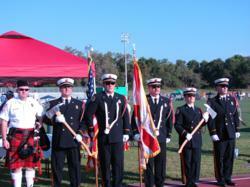 Chief Angle also serves on the Palm Harbor Relay For Life Committee as the Operations Chair for the event. Team fundraising is well underway and the Palm Harbor Fire Rescue Team has already raised $2360 so far for this year’s event. The Palm Harbor Fire Rescue team “Rescue Heroes” plan to host a chili and salsa fundraiser along with fire truck rides on the Dalmatian truck at the event to raise additional donations for the American Cancer Society. To find out more information about Relay For Life Palm Harbor, FL, visit http://www.relayforlife.org/palmharborfl. Relay for Life is the American Cancer Society’s signature fundraising event, and is driven by volunteers. Relay for Life began in 1985 when colorectal surgeon Dr. Gordon Klatt decided to raise money for the American Cancer Society in honor of his patients by walking around a track in a 24 hour period. Today, Relay For Life events are held in more than 5,000 communities spanning 21 countries and have raised an estimated over $3 billion. All proceeds go to funding cancer research with the aims of stomping out the disease. In addition to fundraising, the event also raises awareness of the disease and furthers the American Cancer Society’s efforts to save lives by helping people stay well, helping them get well, and by finding cures and fighting back. More information on Relay for Life is available at http://www.relayforlife.org. The American Cancer Society is a nationwide community-based voluntary health organization dedicated to eliminating cancer as a major health problem by preventing cancer, saving lives, and diminishing suffering from cancer, through research, education, and advocacy. The American Cancer Society is the nation’s largest non-governmental investor in cancer research, contributing about $3.4 billion to date. As a result, more than 11 million people in America who have cancer will be celebrating their next birthday. To learn more about the American Cancer Society, visit http://www.cancer.org.